It was a fairy tale castle if ever I saw one! It looked brooding and distant surrounded by 410 acres of beautifully groomed, gently rolling green located in Newmarket-on-Fergus, County Clare, in the west of Ireland. But this 16th century castle proved to be a warm and welcoming place, with a friendly and very accessible staff. I’d seen more pretensions at places with so much less grace and magic. 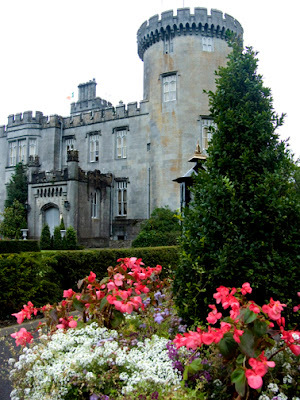 Dromoland is luxurious ambiance, for sure, but don’t be put off. That’s only part of the tale of this castle-in-waiting. The openness and hospitality of the staff are genuine, and they sincerely reach out to children and adults naturally and with terrific good humor. When we checked in, for example, a tall, handsome gentleman swooped down on us, and carried our luggage to our room. And on the last day, when my wife was frantic with the realization she lost her camera with all the images of our entire trip, this gentleman jumped in a golf cart with Wendie and tore around to the places she had been, looking for the camera. We found it where it was all along: in her luggage. And we found out that the helpful man was the director of sales and marketing, Mr. John Hehir, himself getting ready for a flight to the States. Just another day in his job of keeping guests happy. 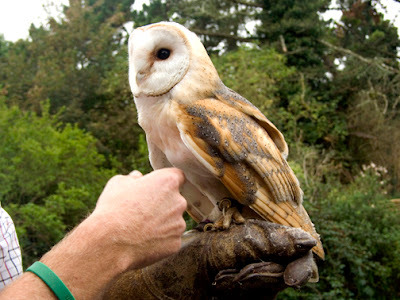 As far as activities go, children are welcomed to any of the classic Irish recreational activities, supervised by one of The Dromoland family-friendly staff, like Dromoland Castle’s falconer David Atkinson, a handsome Irishman with a winning smile and winning ways with his falcons. For the curious there are guided tours of the castle, with a cool introduction to the rich, and occasionally “scary” history… or a fun hide-and-seek in the forests and gardens. Dromoland has a children’s menu, and for the popular family movie night, some great snacks (that also show up at turn-down) like lollipops, cookies and warm milk, and teddy bears. Weather permitting, there are pedal Go-Karts and some very intimate small towns nearby to explore. I personally enjoyed the friendly if noisy ducks hanging around the pocket-size pond. The Irish, as I have come to know them, are very witty, fun-loving people with big hearts and a ready smile or story to tell.